Dental veneers are thin, tooth-colored shells that are attached to the front surface of teeth to improve their appearance. They’re often made from porcelain or resin-composite materials and are permanently bonded to your teeth. Veneers can be used to treat a number of different cosmetic concerns, including chipped, broken, discolored, or smaller-than-average teeth. Some people may only get one veneer in the case of a broken or chipped tooth, but many get between six to eight veneers in order to create an even, symmetrical smile. The top front eight teeth are the most commonly applied veneers. PORCELAIN VENEERS AND LUMINEERS—WHAT IS THE DIFFERENCE? Porcelain veneers are thin pieces of advanced ceramic that are bonded to the front of your teeth. They can be used to give your teeth a completely new front and top, depending on how much they are designed to cover. In the process they reshape your tooth and give it a nice white color. Lumineers are a special kind of porcelain veneer. Most of the time, some of your natural tooth is removed to make room for a traditional porcelain veneer. But Lumineers are designed to be bonded to your tooth without the removal of any of your natural enamel. This makes the procedure completely reversible, but has its limitations. Lumineers may not always give the best cosmetic results, and they can’t be used in some situations where removing natural teeth material is important to proper fit. During your consultation, we can help you understand the benefits and limitations of each type of dental veneer so you can get the one that’s right for you. Another alternative for reshaping your teeth is BioClear, which uses flowable composites to reshape your teeth. The procedure only takes one visit, and it’s less expensive than porcelain veneers, although the results are not quite as good. • Porcelain veneers are very durable. Although porcelain veneers are very thin, usually between 0.5 – 0.7 millimeters and inherently brittle, once bonded to healthy tooth structure it becomes very strong. Porcelain veneers can last for many years, usually 10-15 years, if you take good care of them using good oral hygiene and avoiding using them to crack or chew hard objects like ice. • Porcelain veneers create a very life-like and natural tooth appearance. The translucent properties of the porcelain allows the veneers to mimic the light handling characteristics of enamel giving it a sense of depth which is not possible with other cosmetic bonding materials such as composite resin. • Porcelain veneers resist staining. Unlike other cosmetic dental bonding materials, porcelain is a smooth, impervious ceramic and therefore will not pick up permanent stain from cigarette smoking or from dark or richly colored liquids or spices. • Porcelain veneers are conservative. Only a small amount of tooth structure is removed, if any during the procedure. It typically takes between one and two weeks after your dentist creates your mold to get your veneers back from the lab. Next, your dentist thoroughly cleans your teeth. This is important, as it keeps bacteria from being trapped under the veneer and causing decay. After they do this, they use the grinding tool to create a rougher texture on each tooth on which a veneer is to be applied. This makes it easier for the veneer to stick to the tooth. 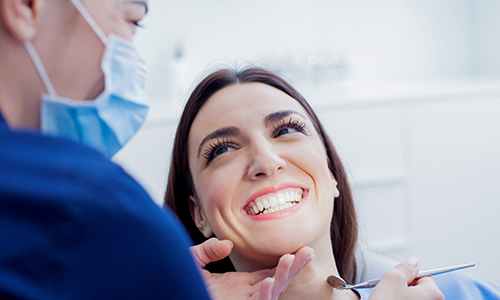 This second appointment (where veneers are placed) typically doesn’t last longer than two hours, though it might be an extra thirty minutes if a local anesthetic is used. How Much Time Does It Take to Make Dental Veneers? During the second appointment we clean and polish the prepared teeth. Then we use an adhesive to bond the veneers to the teeth. A harmless, high-intensity light hardens the adhesive. Once in place, veneers virtually become part of the teeth. You can use them like you would your own teeth. The bond is extremely strong. The final result is beautiful and natural looking teeth. 1. An impression is taken to make an exact reproduction of your mouth and teeth so that the veneers can be custom made by the laboratory. Minor tooth preparations may be required to create room for the veneer. 2. To help adhere the veneer to the tooth surface, the tooth is etched with a mild acid solution to slightly roughen the surface. 3. Veneers are applied individually and permanently bonded to the tooth surface after you have approved shape and color. What are the Advantages of Choosing Dental Veneers? No. Continue to follow good oral hygiene practices including brushing and flossing as you normally would.